I wanna make a level to bring this back cuz i wanna see this be continued. Anyway i wanna take 1-Castle Since the level list is empty on that level. Normal Castle Tileset. No tilesets for that theme seen. I thought you didn't want to be part of the Community Remix anymore. ok then fine close it i guess no one will work on this but whatever im out. EDIT2: Level changed a bit. Well, judging your level isn't very easy, when you link area 2 twice and area 3 is the vanilla area 3. But only judging area 2: That bonus room has a bad level design. You would die in that room if you'd go to the left and the tile placement is, eh, bad. 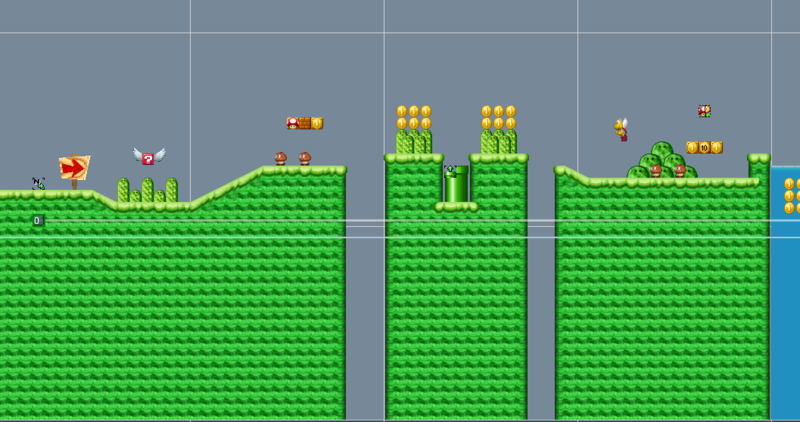 Ok working on the level. Might want to remove that crappy Pipe section in the castle. Other than that nice level. Although, why are you using the Underground block tileset? Sorry for the bump, but can I apply for the level 1-1? I read the rules, but my level is 99% done. I just need to fix an issue with the checkpoint. I will update this post with a link when the issue is solved. In the meantime, have some screenshots! EDIT: The issue has been solved! Uh, hate to tell you, but the community remix is dead "Sleeping"
Oh. Well that's too bad. I spent almost all day making that level! er, I see quite a bunch of flaws in your level design. The positions of goombas, coins and water for example. I see that the enemy placement is weak, but what's wrong with the water and coins? I don't see whats wrong with the enemy placement. It should be easy, that is why he applied for Level 1-1. However, I would not recommend using the 2d water, because it doesn't look good in the way Nintendo created it. Reasons for this are that it is not animated (it's static like ice) and when swimming to the edge/border of the water Mario/Luigi shows some body parts outside the water and in front of the solid tiles. Know your constraints when you design a level and you won't have these issues. It's a big maze level with a (hopefully) unlimited timer so you can easily make your way through without dying from that. EDIT: I forgot to mention, it has 3 areas.